When one reads that the occupations of Samuel Palmer and his friends at Shoreham were “literature, and art, and ancient music,”1↤ 1 A. H. Palmer, The Life and Letters of Samuel Palmer, 1892, p. 53. curiosity is aroused by the last of these activities, as it is the one about which the least is known. From his youth, Palmer was both a singer and a violinist2↤ 2 Raymond Lister, Samuel Palmer, a Biography, 1974, p. 28. and Francis Finch had considerable skill as a pianist and counter-tenor. Thus, it is not remarkable to discover that the Ancients passed their evenings with such contemporary songs as Moore’s Irish Melodies (Finch’s rendition of “The Minstrel Boy” was especially remembered)3↤ 3 Eliza Finch, Memorials of the Late Francis Oliver Finch, 1865, pp. 331, 356. , although the vision of Palmer and Calvert walking through Shoreham to Palmer’s singing of “The British Grenadiers” places a heavier demand upon the imagination. (Presumably Palmer sang the older version of the tune, with a rising phrase and a turn for the words “none that can compare”).4↤ 4 A. H. Palmer, p. 28n. Another musical enterprise of the Ancients has been recorded: ↤ 5 Finch, p. 45. And become worse to make his title good. When we try to identify the “ancient music” which provided a more thoughtful contrast to “Locke” and Tom Moore, we might do well to remember that, in the early nineteenth Century, the phrase “ancient music” would have suggested the “Concerts of Ancient Music” given under Royal patronage. The definition of “Ancient” in this context was “no music less than twenty years old,” but the repertory was primarily Handelian, although works by the older English composers were also performed. In the light of this it is interesting to find this reference in a letter of 5 June 1836 from Palmer to Richmond: ↤ 8 The Letters of Samuel Palmer, ed. Raymond Lister (Oxford, 1974) I, 77. There is one firm clue concerning the musical repertory of “The Ancients.” In his memorial essay on Francis Finch, Palmer writes, ↤ 9 Finch, pp. 355-56. Given this, we may attempt to discover the extent to which music by these composers would have been available in the 1820s. At this point, it should be noted that, apart from a few pieces printed in such collections as Stafford Smith’s Musica Antiqua, Palmer and his friends would have had no access to Dowland, Campion and the earlier English composers whose printed works have a poor rate of survival and whose notation would have presented considerable difficulties. 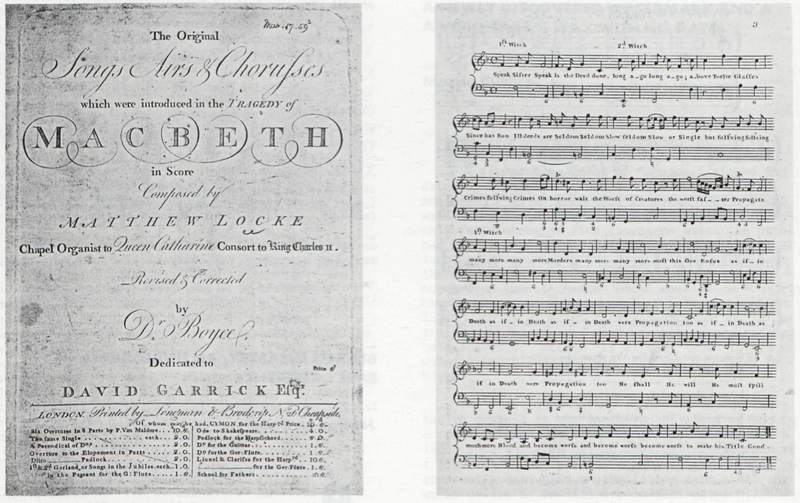 Pages from (title page of) Leveridge’s music for Macbeth. Where pleasure mixt with profit lyes. Croft’s Musica Sacra was published in 1724. It seems unlikely, judging from the complexity of the part writing, that the Ancients would have sung the choral anthems and, while the accomplished Finch would have been able to sing the vocal line of any of the solo anthems, there would have been no instrument available for the accompaniment. Especially in view of the fact that thirty Select Anthems by Croft, with convenient pianoforte/organ accompaniments, were published in 1847, it seems likely that Finch sang these pieces to Palmer after they had left Shoreham. Boyce’s Cathedral Music, with Arnold’s continuation, does, however, provide three comparatively easy pieces: “I call and cry,” “Hear the voice and prayer” and “All people that on earth do dwell.” There is one piece of which we may be sure, as it recurs in many collections, and that is Tallis’ Canon, which was used throughout the period as an evening hymn. The idea of the evening hymn is strong, in Palmer’s world. There is the painting Coming from Evening Church; there is his statement that ↤ 11 A. H. Palmer, p. 13. Lull to soft rest the weary day . . . 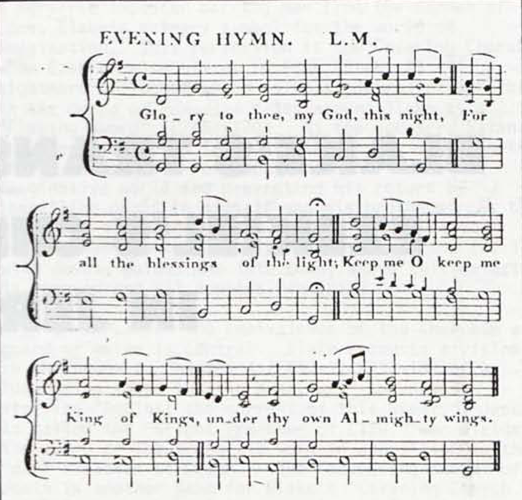 The Evening Hymn in a contemporary hymnbook. ↤ 12 Lister, pp. 70-71.